Adenoviral gene transfer into naive CD4 T cells with transgenic expression of the Coxsackie adenovirus receptor enables the molecular analysis of regulatory T cell differentiation in vitro. Warth, S. C., Heissmeyer, V. Adenoviral Transduction of Naive CD4 T Cells to Study Treg Differentiation. J. Vis. Exp. (78), e50455, doi:10.3791/50455 (2013). Regulatory T cells (Tregs) are essential to provide immune tolerance to self as well as to certain foreign antigens. Tregs can be generated from naive CD4 T cells in vitro with TCR- and co-stimulation in the presence of TGFβ and IL-2. This bears enormous potential for future therapies, however, the molecules and signaling pathways that control differentiation are largely unknown. Primary T cells can be manipulated through ectopic gene expression, but common methods fail to target the most important naive state of the T cell prior to primary antigen recognition. Here, we provide a protocol to express ectopic genes in naive CD4 T cells in vitro before inducing Treg differentiation. It applies transduction with the replication-deficient adenovirus and explains its generation and production. The adenovirus can take up large inserts (up to 7 kb) and can be equipped with promoters to achieve high and transient overexpression in T cells. It effectively transduces naive mouse T cells if they express a transgenic Coxsackie adenovirus receptor (CAR). Importantly, after infection the T cells remain naive (CD44low, CD62Lhigh) and resting (CD25-, CD69-) and can be activated and differentiated into Tregs similar to non-infected cells. Thus, this method enables manipulation of CD4 T cell differentiation from its very beginning. It ensures that ectopic gene expression is already in place when early signaling events of the initial TCR stimulation induces cellular changes that eventually lead into Treg differentiation. Tregs are crucial to maintain immune tolerance and to dampen overshooting immune responses. Tregs suppress bystander T cell activation. Consequently, ablation of Tregs leads to fatal autoimmunity and self-destruction driven by activated T cells1. Tregs develop in the thymus during negative selection of CD4 single-positive precursors, but they can also differentiate in the periphery from naive CD4 T cells upon low-dose antigen stimulation with suboptimal co-stimulation 1,2. Thymic Tregs seem to suppress tissue autoimmunity against self-antigens, whereas peripheral Tregs have been implicated in providing tolerance in the gut or lung. These induced Tregs potently prevent T cell activation after recognition of foreign antigens in the mucosa, including environmental antigens from food and air, commensal bacteria, and allergens 3,4. In addition, Tregs are crucial to establish maternal tolerance to fetal peptides 5 and to prevent graft-versus-host disease 6. At the same time, Tregs also mediate unwanted effects by attenuating immune surveillance of tumor cells 7,8. The hallmark feature of Tregs is the expression of the subset-specifying transcription factor Foxp3, a fork-head domain-containing transcription factor that is necessary and sufficient to confer Treg function 9,10. Some signaling pathways that can induce Foxp3 expression are known. However, the molecular processes that control, regulate, or modulate Treg differentiation in response to T cell receptor triggering are less well understood. Tregs can very effectively be induced in vitro through the stimulation of naive CD4 T cells with anti-CD3 and anti-CD28 antibodies in the presence of TGFβ and IL-2 11. As the emerging Tregs are functional in vivo, the manipulation of molecules that promote Treg differentiation bears enormous potential for future therapies, for example, the treatment of asthma, Crohns disease, and transplantation 11,12. Conversely, therapeutic modulation of molecules to block Treg differentiation may provide benefit in future approaches of combined treatment of tumor patients. 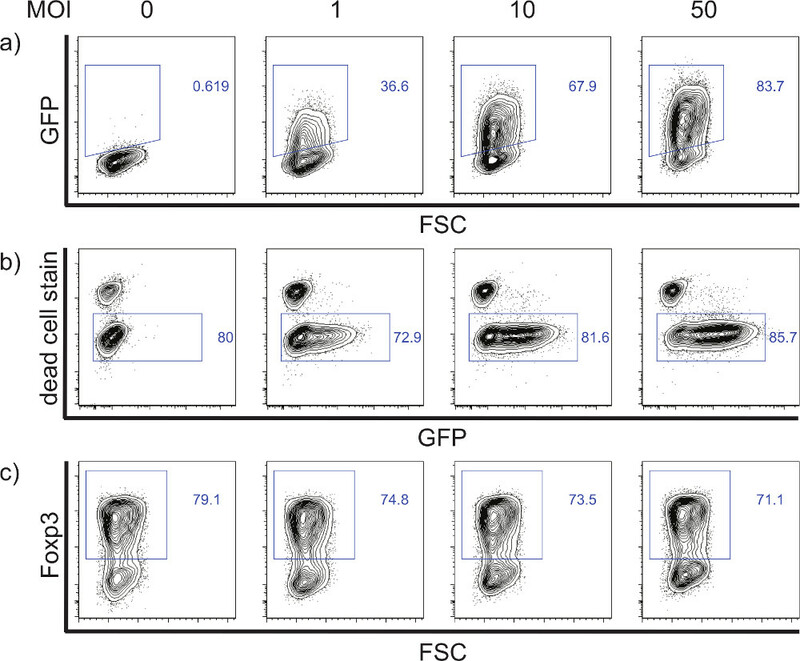 In vitro differentiation assays have been instrumental for the description of molecular changes that are associated with T cell subset differentiation. At the moment, experimental attempts to search or screen for gene products that control T cell differentiation are hampered by the fact that the most common methods of ectopic gene expression fail in naive T cells. For example, electroporation and retroviral transduction are only effective in activated T cells. In contrast to initial expectations, lentiviral transduction, which is typically effective in resting cells, requires pre-activation of naive T cells by cytokines13. Furthermore, the transfer of cDNA or mRNA during electroporation involves depolarization of the plasma membrane, which itself confers features of T cell activation and may even mobilize Ca2+ signaling and activate NFAT proteins (unpublished observation and ref. 14). Similarly, for retroviral transduction, the naive T cells have to be activated for 18 - 40 hr. During this time, the breakdown of the nuclear membrane in the course of cell division occurs and allows for the subsequent genomic integration of the retroviral vector 15. These methods are therefore not able to address the early molecular regulation of initial T cell encounter with antigen, which is the decisive phase of helper T cell differentiation. Adenoviral transduction is known to confer transient ectopic gene expression in a number of human cell types that express the human Coxsackie adenovirus receptor (CAR). It proceeds without requirement for cell activation or cell-cycle progression. The surface expression of CAR is essential for efficient virus attachment and internalization, and transgenic expression of the truncated version CARΔ1 under a T cell-specific promoter was found to render mouse thymocytes and T cells susceptible to adenoviral infection 16. Importantly, the transgene does not alter thymocyte development or in vitro differentiation of naive CD4 T cells into different subsets (data not shown; ref. 17). Adenovirus-mediated transduction of T cells was previously used for overexpression 17,18 and knock-down approaches 19,20. The transgenic T cells can be purified from commercially available DO11.10 tg; CARΔ1 tg (Taconic, Inc. and ref. 17). Importantly, adenoviral transduction allows high expression of a gene of interest in naive T cells without inducing obvious signs of activation. The T cells remain naive (CD44low, CD62Lhigh) and resting (CD25-, CD69-) after infection and can be activated and differentiated into Treg similar to non-infected cells. 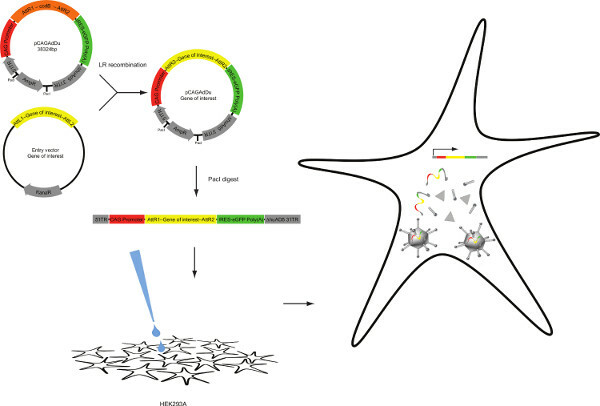 Production of recombinant adenoviruses can be achieved after transfection of HEK293A cells with adenoviral plasmids (Figure 1). These plasmids typically contain the human type 5 adenovirus genome with E1 and E3 genes deleted to render recombinant adenoviruses replication-incompetent 21. HEK293A cells complement replication deficiency as they have been immortalized through stable integration of sheared adenovirus 22. Since adenoviral vectors are large (~40 kb) and consequently not well suited for traditional restriction enzyme-mediated cloning, we employed the Gateway system. The gene of interest is initially cloned into a smaller entry vector, from which it can be easily transferred into the adenoviral destination vector via lambda recombination reaction (LR) 23. We constructed the pCAGAdDu vector by combining the CAG promoter (chicken actin promoter and CMV enhancer) with an expression cassette containing LR sites flanking the procaryotic ccdB selection marker 24 . This expression cassette is fused to an internal ribosome entry site (IRES) element that allows coexpression of the eukaryotic infection marker enhanced green fluorescent protein (eGFP), which is fused to a sequence containing the bovine growth hormone poly(A)-signal. We chose the CAG cis-regulatory sequences, since the prototypic CMV promoter was found to be highly activation-dependent and therefore unfavorable for gene expression in naive T cells. Here, we provide a protocol for efficient in vitro Treg differentiation and a method to transduce naive CD4 T cells without activation (Figure 2). The method enables ectopic gene expression or knock down preceding CD4 T cell differentiation at the naive state. It allows testing the effect of an overexpressed gene of interest during early signaling events upon initial TCR stimulation until T cell subset commitment. Our validation experiments also provide the basis to establish similar adenovirus application in the differentiation of other T cell subsets such as Th1, Th2, Th9, Th17, Th22, or Tfh cells. Clone the gene of interest into an entry vector. PCR amplification of the gene followed by blunt-end ligation into a topoisomerase-coupled vector (e.g. pENTR/D-TOPO) or restriction enzyme-mediated cloning may be used for this procedure. Transfer the gene of interest from the entry vector into the destination vector by LR recombination (e.g. Gateway LR Clonase II Enzyme Mix). This will create the adenoviral expression vector (Figure 1). Linearize 10 μg of the adenoviral expression vector in a PacI restriction digest, precipitate the DNA and resuspend it in water at a concentration of 3 μg per 100 μl. Linearization liberates the viral inverted repeats (ITR), which are required for replication and encapsidation of the viral DNA into virus particles. Seed 1 x 105 HEK293A cells in 2 ml cell culture media (DMEM, 10% FBS, 5% PenStrep) in one well of a 6-well plate and incubate the cells for 6 - 14 hr at 37 °C in a 10% CO2 incubator to allow them to adhere. Cells should then be at approximately 50% confluency. Lipofection: Transfer 6 μl of jetPEI reagent into 94 μl of 50 μM NaCl, vortex briefly. Add the mixed solution to 100 μl linearized adenovirus vector while vortexing and incubate this transfection mix for 15 - 30 min at room temperature. Perform all following steps under the appropriate biosafety conditions for adenovirus infection! Dispense the solution dropwise on the HEK293A cell-containing well and incubate the cells at 37 °C and 10% CO2. When using a fluorescence marker, evaluate the transfection efficiency visually after 12 - 36 hr using an inverted fluorescence microscope. Add 0.5 ml of fresh medium every 3 days. Check every 2 - 3 days with a light or fluorescence microscope for cytopathic effects (CPE), which are areas with enlarged and rounded cells that start to detach. This is indicative of efficient virus generation. Upon occurrence of broader zones of CPE (Figure 3), it will take 24 - 72 hr before all cells are infected. When all cells show signs of CPE, but before an overall detachment of cells occurs, detach the cells by gentle pipetting and transfer cells with supernatant (SN, 3 - 5 ml) to a 15 ml polystyrene tube. Freeze the cells in the SN on dry ice for 15 - 20 min and thaw them quickly at 37 °C afterwards to rupture the cells. Repeat this freeze-and-thaw-cycle (F/TC) two more times. Keep the primary virus lysate on ice for usage within a day or freeze it at -80 °C for long-term storage. Any additional F/TC will reduce the virus titer by 30 - 50%. Seed and grow HEK293A cells to 90% confluence on a 14 cm tissue culture dish. Infect the cells with half of the primary virus lysate (1.5 - 2.5 ml) and incubate the cells for at least 36 hr. Nearly all cells should be infected then, which can be determined by fluorescence microscopy. For the re-amplification of an already amplified (i.e. more concentrated) virus stock, infect HEK293A at a multiplicity of infection (MOI) of 50 (see 6.3). Detach the cells by gentle pipetting and transfer cells and SN to a 50 ml polystyrene tube. Spin cells down at 300 x g for 10 min at 4 °C. Remove the SN and resuspend the pellet in a suitable volume of medium or SN (ca. 1 ml). Perform 3 F/TC to disrupt the cells and centrifuge at 800 x g for 15 min at 4 °C. Take off the SN that contains the virus particles (i.e. the concentrated virus lysate), and aliquot the virus lysate to store it at -80 °C. Seed 105 A549 cells per well into 5 wells of a 12-well plate in 1 ml medium and let cells adhere for 6 hr. Use 1 μl of concentrated adenovirus (thawed on ice) to perform a serial dilution in medium (1:5,000, 1:10,000, 1:50,000, 1:100,000) and add 10 μl per well. Leave one well uninfected to adjust the gating in flow cytometry. After 36 hr, take off the SN, wash with PBS and detach cells (e.g. by trypsinization). For biohazard precautions, it is recommended to fix cells in 100 μl 4% paraformaldehyde in PBS for 10 min at room temperature and wash with PBS one time. Perform a FACS analysis of infection marker expression. Plot 'μl viral lysate applied' against the absolute number of infected cells (Figure 4). Determine the linear range of infection and calculate the titer per ml of undiluted virus from the standard curve over the linear range using x = 1,000 μl. Isolate naive/resting CD4 T cells from DO11.10 tg; CARΔ1 tg mice using MACS (Naive CD4+ T Cell Isolation Kit II) or FACS sorting (CD4+ CD25- CD62L+ CD44-). For small-scale experiments, pipette an appropriate volume of viral lysate to achieve an MOI of 50 into one well of a 96-well round bottom plate. Add up to 4 x 105 T cells in a final infection volume of 50 μl in T cell medium (RPMI1640, 10% FBS, 5% PenStrep, 5% NaPyruvate, 1x NEAA, 1x MEM Essential vitamin, 1x L-Glutamine, 1:250,000 Mercaptoethanol, 10 mM HEPES). Note: for infection of larger cell numbers, scale up using an MOI of 50 in an infection volume of 165 μl per 106 naive T cells in a polystyrene tube with loose cup (up tp 3 ml per tube). Incubate cells for 90 min at 37 °C in a 5% CO2 incubator. Spin down cells at 300 x g for 5 min at room temperature, take off SN, resuspend in 200 μl PBS. Centrifuge again and take off SN. Resuspend cells in 200 μl T cell medium without stimulating antibodies and without IL-2 or other cytokines and rest them for 40 hr at 37 °C in a 5% CO2 incubator to allow expression of the gene of interest before activation. Pipette a volume of anti-CD3- and anti-CD28-coupled beads that equals the cell number (e.g. 4 x 105) into a small reagent cup, add the 10-fold volume of PBS and put them on a magnet for 2 min. Take off the supernatant and resuspend the beads in 200 μl polarizing medium (for Tregs: T cell medium + 1 ng/ml TGFβ, 100 U/ml IL-2). Note: Cells can also be activated using tissue culture dishes coated with anti-CD28 and anti-CD3 antibodies, or in a DO11.10 T cell receptor-specific manner using irradiated BALB/c splenocytes pulsed with ovalbumin 323-339 peptide antigen. Centrifuge the rested cells as before, take off the SN and resuspend cells in 200 μl polarizing medium containing anti-CD3- and anti-CD28-antibody-coupled beads. Incubate for 72 hr at 37 °C in a 5% CO2 incubator without changing medium. Wash cells: Spin down cells at 300 x g for 5 min at room temperature, take off SN, resuspend in 200 μl PBS. Centrifuge again and take off SN. Perform all following washing steps accordingly. Resuspend the cells in 100 μl fixable dead cell staining solution and incubate for 30 min at 4 °C. Wash cells, resuspend in 100 μl PBS, add 100 μl 4% paraformaldehyde in PBS, incubate 15 min at RT. Wash cells, resuspend them in 200 μl ice-cold 70% methanol in PBS and incubate for 30 min on ice. Note: Cells can be treated from now on without biohazard precaution! Prepare 60 μl master-mix of 60 μl PBS + 10 μg/ml Fc-block (anti-FCR3 to block unspecific binding). Wash cells, resuspend them in 40 μl of PBS + anti-FCR3 and incubate 15 min at RT. Add 20 μl of PBS + anti-FCR3 containing 1 μg PE-coupled anti-Foxp3 antibody, mix well and incubate at 4 °C over night. Wash cells twice in PBS and analyze cells on a flow cytometer. For generation of high virus titers, the timing of HEK293A cell harvest in primary virus production or virus amplification is crucial. Representative fluorescent and phase contrast images with visual signs of virus production are shown in Figure 3. The CPE were observed 10 days after transfection of HEK293A cells with a control pCAGAdDu vector without insert. CPE are characterized by the appearance of areas with enlarged and round-up cells that start to detach and exhibit high expression of the infection marker GFP. The extent of CPE is indicative of efficient virus generation. Cell culture plates showing similar CPE can be harvested within 24 - 72 hr, and a raw virus lysate can be generated by freeze-and-thaw cycles. The virus titer can then be determined by serial dilution of the virus lysate to allow the comparison of infections with an equal MOI (Figure 4). Within the linear range, the regression analysis equation can be used to calculate the number of infectious particles per ml undiluted virus lysate. In the example, the titer for x = 1 μl is 30,016,535 μl-1 ≈ 3 x 1010 ml-1. The effects of adenovirus transduction on target cells have been evaluated by infecting naive CD4 T cells with increasing MOIs using an adenoviral control vector that only expresses IRES-GFP (Figure 5a). The infection efficiency was measured by FACS analysis determining GFP positive cells in fixed T cell samples 72 hr after induction of Treg differentiation. The rate of GFP positive cells increased with the MOI used for infection and reached 84% infection at an MOI of 50. We do not obtain much higher percentages of infected T cells when using MOI greater than 50 (data not shown). Although infection efficiency may vary depending on the gene of interest, one can typically infect more than 50% of the cells at an MOI of 50. At MOIs between 1 and 50 the cell viability was not affected (Figure 5b). Importantly, the stimulation and differentiation of naive T cells into Tregs was similar in the infected compared to the non-infected cells (Figure 5c). A key property of the adenovirus transduction is its ability to infect naive and resting T cells without conferring or requiring T cell activation. This is obvious from the analysis of markers of T cell activation (CD25, CD69, CD44) and the marker of naive (CD62L) T cells in samples with or without adenovirus infection and resting for 40 hr at 37 °C in a 5% CO2 incubator (Figure 6). Before in vitro T cell activation with anti-CD3- and anti-CD28-coupled beads, the infected and uninfected T cells were similarly CD25low, CD69low and CD44low but CD62Lhigh, demonstrating their naive and resting state (Figure 6, upper panels). Upon T cell activation, the infected cells showed upregulation of the activation markers CD25, CD69 and downregulation of CD62L almost indistinguishable from uninfected cells (Figure 6, lower panels). Thus, the activation status of T cells is not altered by adenovirus infection. The resting phase is associated with the loss of 60 to 70% of the cells due to the absence of growth factors or cytokines, compared to 10 - 20% dead cells 40 hr after activation without resting. This was taken into account when choosing the initial cell number of 3 x 105 cells. In order to evaluate the amount of overexpression achieved by adenoviral gene transfer, we sought to determine the microRNA-155 (miR-155) expression levels in naive T cells that were infected with miR-155-expressing or control adenovirus or were left uninfected. We chose miR-155 since this mature miRNA is expressed at moderate levels in naive T cells and becomes strongly induced upon T cell activation. Furthermore, it has a crucial role in T cell-dependent humoral responses 25,26. The level of microRNA overexpression was evaluated by qPCR. After infection, cells were rested for 40 hr, activated for 40 hr, or rested 40 hr followed by 40 hr of activation. After 40 hr resting, the naive T cells infected with miR-155 encoding virus displayed an approximately 17-fold overexpression of miR-155 compared to cells infected with control virus or non-infected cells (Figure 7). This almost matched the extent to which the endogenous miR-155 is induced after T cell activation (Figure 7 and ref. 25,27). Regardless of this strong induction of the endogenous miR-155 levels, cells infected with miR-155 adenovirus still showed about four-fold increase in expression of miR-155 upon activation compared to control virus-infected or non-infected cells. The observed level of ectopic overexpression was comparable for other microRNAs (data not shown). Please note that for large inserts, overexpression may be less effective. The data analysis can be performed in several ways. Analysis of differentiation in the GFPpositive gate of a gene of interest (i.e. in the infected cells) compared to differentiation in the same GFPpositive gate of control cells (infected cells using a vector without gene of interest) is sufficient to detect substantial differences. To study more subtle effects of a gene of interest, we have compared the differentiation in infected cells with that of non-infected cells from the same well (Figure 8). These serve as an internal control and can be utilized to calculate the "relative differentiation" inside a well. If a virus has no effect on differentiation, the "relative differentiation" will ideally be 1. The relative differentiation for the control virus in our hands has a range of 0.9 to 1.1. Relative differentiation should only be applied to comparing gene-of interest-infected samples to control virus-infected samples. Figure 1. Schematic representation of adenovirus generation. Entry vectors (pENTR) contain recombination donor sites (AttL1, AttL2), which flank a gene of interest. The destination vector pCAGAdDu contains the recombination target sites (AttR1, AttR2) flanking the toxin CcdB gene for negative selection in E. coli, which is replaced by the gene of interest through LR recombination. The destination vector also contains a human type 5 adenovirus genome without E1/E3 genes, which have been deleted to generate replication-deficient recombinant adenoviruses. PacI linearization liberates inverted repeats (ITR) before transfection into HEK293A cells that bear the adenoviral genes to generate infectious adenovirus particles that result in cytopathic effects. Adenovirus is harvested from producing cells by freeze-and-thaw cycles. Click here to view larger figure. Figure 2. Schematic representation of T cell infection and differentiation. Naive T cells were infected with an adenovirus lysate for 1.5 hr, washed with PBS and rested in T cell medium for 40 hr at 37 °C in a 5% CO2 incubator. The cells were then activated for 72 hr using anti-CD28 and anti-CD3 antibody-coupled beads in the presence of TGFβ and IL-2. Fixed and stained cells were analyzed by FACS, and the expression of Foxp3 in infected versus non-infected cells was determined. Figure 3. Cytopathic effect of adenovirus-producing HEK293A cells. Occurrence of CPE at day ten after transfection of 105 HEK293A cells with 3 ng of linearized pCAGAdDu vector. The left panel shows the phase contrast image, the right panel shows the green fluorescence. Figure 4. Determining the titer of adenovirus lysates by infection of A549 cells. 105 A549 cells were infected with the indicated virus dilution, incubated for 48 hr and analyzed for expression of the infection marker GFP by flow cytometry. The number of GFPpositive cells is plotted against the amount of virus used. The titer of undiluted virus is calculated from the standard curve over the linear range using x = 1,000 μl. Figure 5. Adenovirus infection at an MOI of 1 - 50 has no effect on T cell viability or Treg differentiation. Naive T cells purified from DO11.10 tg; CARΔ1 tg mice were infected with adenovirus at different MOIs for 90 min, washed with PBS and rested for 40 hr in T cell medium. Cells were activated in Treg polarizing conditions for 72 hr. Fixed and stained cells were analyzed for incorporation of dead cell dye (b), expression of the infection marker GFP (a) and of the differentiation marker Foxp3 (c). Click here to view larger figure. Figure 6. Adenovirus infection does not alter the activation status of T cells. Naive T cells from DO11.10 tg; CARΔ1 tg mice were infected with adenovirus at an MOI of 50 for 90 min (lines) or left uninfected (areas), washed with PBS and rested for 40 hr. Cells were analyzed for expression of activation markers before (upper panels) and after (lower panels) 40 hr of activation in Treg polarizing conditions. Figure 7. Relative miR-155 overexpression before and after T cell activation. Naive T cells from DO11.10 tg; CARΔ1 tg mice were infected at an MOI of 50 with microRNA-155 (miR-155)-expressing or control adenovirus, or left uninfected. Cells were then rested for 40 hr, activated for 40 hr, or rested 40 hr followed by 40 hr activation. Expression of microRNA-155 was determined relative to SnoRNA202 by qPCR. Figure 8. Data analysis using 'relative differentiation' of Treg cultures. The percentage of Foxp3+ cells in GFPpositive (i.e. infected cells) is expressed relative to the percentage of Foxp3+ cells in GFPnegative (non-infected) cells. Relative differentiation equals 1, if the overexpressed gene of interest had no effect on Treg differentiation. Values above 1 indicate a promoting effect on differentiation, whereas values below 1 indicate an inhibitory effect. For optimal transfection results, the quality and amount of linearized vector appear most important. We did not observe negative effects on primary lysate production from an initial overgrowth of the culture since the infection will quickly proceed once efficient virus production occurs. However, virus production by HEK293A cells can be affected by long inserts that decrease the efficiency. Some open reading frames were actually found to interfere with virus production. These viral stocks can typically be rescued through several rounds of amplification, and only few open reading frames were found to be incompatible with virus production. From our experience, the appearance of CPE within 48 hr after infection for virus amplification will typically yield a viral lysate of about 1 x 109 - 5 x 1010 infectious particles/ml. Adenoviral infection of naive T cells does not change the activation status of T cells before and after stimulation. This makes the transduction system a powerful experimental tool for studying T cell differentiation from initial TCR-stimulation on. We have determined efficient ectopic expression of genes of interest after infection and 'resting' of T cells for 40 hr, at a time when the cell is still naive and does not show signs of activation. This means that during the subsequent T cell activation, the gene of interest is already overexpressed and can exert its influence on T cell differentiation from the beginning. Thus, adenoviral transduction has a clear advantage over electroporation or retroviral transduction that require activation and express a gene of interest only after initial TCR signaling 15,28. However, if late aspects of differentiation shall be analyzed and expression of the gene of interest is not required before initial T cell activation, naive T cells may as well be stimulated directly after adenoviral transduction. Since adenoviral infection is very efficient, it can be extended to study cooperative activities of two genes of interest by performing double infections with adenoviruses that express other infection markers such as Thy1.1 or hCD2. The latter is also accessible to antibody surface staining and may circumvent difficulties in marker preservation during fixation. In activated T cells, however, adenoviral infection has a much lower efficiency, and electroporation or retroviral transduction methods may be favorable. Another caveat for adenovirus application is the transient character of expression. Adenovirus is maintained as an episome attached to the nuclear matrix of the cell and will be diluted as T cells proliferate, leading to the loss of marker gene expression within five to seven days after T cell activation (data not shown; ref. 17). In addition, adenovirus-transduced cells are readily recognized and eliminated by an intact immune system, which limits its use in vivo, for example, in adoptive transfer experiments of T cells in the mouse. Another potential application of the adenoviral system could be the infection of Treg cells isolated from DO11.10 tg; CARΔ1 tg mice to study Treg function or lineage stability aspects. Adenovirus infection was efficient and had almost no influence on T cell viability and Treg differentiation. At an MOI of 50, we obtained the best infection efficiency without observing adverse effects of adenovirus infection on T cells. This has to be similarly established whenever the system is applied to other cell culture or differentiation condition, typically by titration experiments using empty adenovirus without expression of the gene of interest. If the adenoviral infection as such does affect the outcome of the experiment, the comparison of gene of interest-bearing adenovirus with empty adenovirus is still appropriate to uncover effects of the transferred gene of interest. If there is no effect of adenoviral infection, the measured parameter may also be compared between uninfected and infected cells of the same sample. The fixation method described here allows a simultaneous analysis of the differentiation marker Foxp3 together with the infection marker GFP, so a 'relative differentiation' can be determined. This analysis of two populations within one sample has higher sensitivity for subtle effects than bulk population comparisons between two samples, since it takes well-to-well variations into account. However, only effects intrinsic to infected cells will be recognized by this method, while well-wide effects, e.g. influences exerted by a secreted factor, would be neglected. Relative differentiation should be controlled in each experiment by including control-infected cells to exclude effects of infection itself on differentiation. For optimal results, an almost equal rate of infected to uninfected cells within one sample should be aimed for, while higher infection rates are favorable in bulk comparisons among several samples. In conclusion, gene transfer into naive T cells using adenovirus combined with in vitro differentiation protocols is a powerful system to investigate the molecular basis of Treg differentiation. This may allow the generation of knowledge to exploit the dominant tolerance conferred by Tregs in therapeutic approaches against allergic and autoimmune diseases. The authors would like to thank Lirui Du for constructing the pCAGAdDU vector and Oliver Gorka for provision of the fixation protocol. Lahl, K., Loddenkemper, C., et al. Selective depletion of Foxp3+ regulatory T cells induces a scurfy-like disease. The Journal of Experimental Medicine. 204, (1), 57-63 (2007). Kretschmer, K., Apostolou, I., Hawiger, D., Khazaie, K., Nussenzweig, M. C., von Boehmer, H. Inducing and expanding regulatory T cell populations by foreign antigen. Nature Immunology. 6, (12), 1219-1227 (2005). Zhang, X., Izikson, L., Liu, L., Weiner, H. L. Activation of CD25(+)CD4(+) regulatory T cells by oral antigen administration. Journal of Immunology (Baltimore, Md). 167, (8), 4245-4253 (2001). Josefowicz, S. Z., Niec, R. E., et al. Extrathymically generated regulatory T cells control mucosal TH2 inflammation. Nature. 482, (7385), 395-399 (2012). Samstein, R. M., Josefowicz, S. Z., Arvey, A., Treuting, P. M., Rudensky, A. Y. Extrathymic generation of regulatory T cells in placental mammals mitigates maternal-fetal conflict. Cell. 150, (1), 29-38 (2012). Laurence, A., Amarnath, S., et al. STAT3 Transcription Factor Promotes Instability of nTreg Cells and Limits Generation of iTreg Cells during Acute Murine Graft-versus-Host Disease. Immunity. 37, (2), 209-222 (2012). Terabe, M., Berzofsky, J. A. Immunoregulatory T cells in tumor immunity. Current Opinion in Immunology. 16, (2), 157-162 (2004). Li, X., Kostareli, E., Suffner, J., Garbi, N., Hämmerling, G. J. Efficient Treg depletion induces T-cell infiltration and rejection of large tumors. European Journal of Immunology. 40, (12), 3325-3335 (2010). Fontenot, J. D., Gavin, M. A., Rudensky, A. Y. Foxp3 programs the development and function of CD4+CD25+ regulatory T cells. Nature Immunology. 4, (4), 330-336 (2003). Chen, W., Jin, W., et al. Conversion of Peripheral CD4+CD25- Naive T Cells to CD4+CD25+ Regulatory T Cells by TGF-β Induction of Transcription Factor Foxp3. The Journal of Experimental Medicine. 198, (12), 1875-1886 (2003). Xu, W., Lan, Q., et al. Adoptive transfer of induced-treg cells effectively attenuates murine airway allergic inflammation. PloS ONE. 7, (7), e40314 (2012). Circosta, P., Granziero, L., et al. T cell receptor (TCR) gene transfer with lentiviral vectors allows efficient redirection of tumor specificity in naive and memory T cells without prior stimulation of endogenous TCR. Human Gene Therapy. 20, (12), 1576-1588 (2009). Patel, C., Muthuswamy, J. High efficiency, Site-specific Transfection of Adherent Cells with siRNA Using Microelectrode Arrays (MEA). J. Vis. Exp. (67), e4415 (2012). Zhong, S., Malecek, K., Perez-Garcia, A., Krogsgaard, M. Retroviral transduction of T-cell receptors in mouse T-cells. J. Vis. Exp. (44), e2307 (2010). Leon, R. P., Hedlund, T., et al. Adenoviral-mediated gene transfer in lymphocytes. Proceedings of the National Academy of Sciences of the United States of America. 95, (22), 13159-13164 (1998). Wan, Y. Y., Leon, R. P., et al. Transgenic expression of the coxsackie/adenovirus receptor enables adenoviral-mediated gene delivery in naive T cells. Proceedings of the National Academy of Sciences of the United States of America. 97, (25), 13784-13789 (2000). Hurez, V., Dzialo-Hatton, R., Oliver, J., Matthews, R. J., Weaver, C. T. Efficient adenovirus-mediated gene transfer into primary T cells and thymocytes in a new coxsackie/adenovirus receptor transgenic model. BMC Immunology. 3, 4 (2002). Eitelhuber, A. C., Warth, S., et al. Dephosphorylation of Carma1 by PP2A negatively regulates T-cell activation. The EMBO Journal. 30, (3), 594-605 (2011). Glasmacher, E., Hoefig, K. P., et al. Roquin binds inducible costimulator mRNA and effectors of mRNA decay to induce microRNA-independent post-transcriptional repression. Nature Immunology. 11, (8), 725-733 (2010). Russell, W. C. Update on adenovirus and its vectors. The Journal of General Virology. 81, (Pt. 11), 2573-2604 (2000). Graham, F. L., Smiley, J., Russell, W. C., Nairn, R. Characteristics of a Human Cell Line Transformed by DNA from Human Adenovirus Type 5. Journal of General Virology. 36, (1), 59-72 (1977). Landy, A. Dynamic, structural, and regulatory aspects of lambda site-specific recombination. Annual Review of Biochemistry. 58, 913-949 (1989). Bernard, P., Couturier, M. Cell killing by the F plasmid CcdB protein involves poisoning of DNA-topoisomerase II complexes. Journal of Molecular Biology. 226, (3), 735-745 (1992). Thai, T. -H., Calado, D. P., et al. 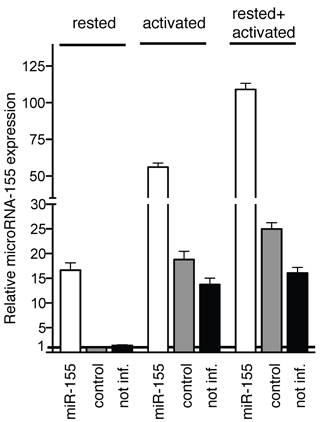 Regulation of the Germinal Center Response by MicroRNA-155. Science. 316, (5824), 604-608 (2007). Rodriguez, A., Vigorito, E., et al. Requirement of bic/microRNA-155 for Normal Immune Function. Science. 316, (5824), 608-611 (2007). Cobb, B. S., Hertweck, A., et al. A role for Dicer in immune regulation. The Journal of Experimental Medicine. 203, (11), 2519-2527 (2006). Steiner, D. F., Thomas, M. F., et al. MicroRNA-29 Regulates T-Box Transcription Factors and Interferon-γ Production in Helper T Cells. Immunity. (2011).